The ditch is located on a north facing slope and has a wide variety of shade-loving plants. 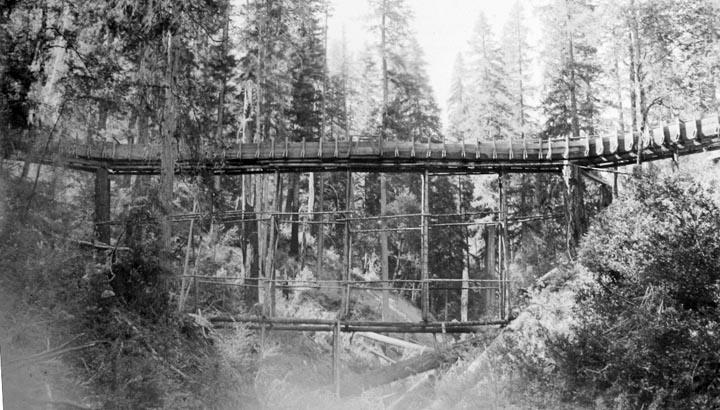 Drive about six and a half miles south of Cave Junction on Highway 199 and turn on Waldo Road (also called Happy Camp Road). This is the beginning of the Jefferson State Scenic Byway. Drive about 5 miles to the stop sign at Takilma Road. Turn right on Takilma Road and drive 3.6 miles to the fork in the road. Go right at the fork and drive about 0.3 miles to the bridge. Immediately after crossing the bridge, go to the left on the dirt road. It is two miles from the bridge to the Osgood trailhead on this road. Note that the gravel road typically has deep potholes for the first half a mile but these become less of a problem once you pass the parking area for the East Fork Trailhead and start climbing up the mountain to the right. Watch for the Osgood Ditch trailhead on the left as you approach mile 2. The parking area is just past this on the right. A water flume made of wood was often used when crossing gullies or small creeks. The trail follows the shoulder of the Osgood Ditch, which generally has a very gentle grade. Several years ago, the ditch experienced a “blow out” where the water breached the wall of the ditch and water eroded a large gully down the mountain side. The trail goes around this and continues. At some places a flue was used to cross gullies. The ditch ends abruptly and a foot trail cross these low areas. Typically the crossings are not difficult except near the end of the trail where the geology changes to harder rock. In this area, the builders of the ditch apparently elected to use a flue to go over the rocks with a wood flume rather than try to excavate a ditch. This section of the trail is marked by rock outcrops and an up-and-down, poorly defined trail over the rock outcrops. If you continue, there is a fair amount of rock scrambling involved to get to the other side of the gully and, once you get back on the ditch, the Osgood Trail ends within a few yards at the East Fork Trail to the Siskiyou Wilderness. For most people, it is best to turn around before going over these rocks and return to your vehicle. 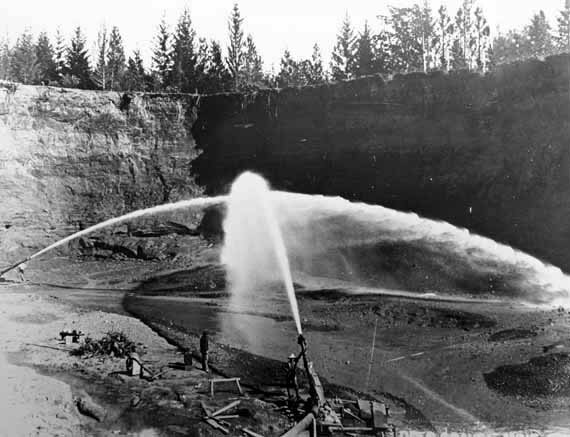 Water from the Osgood Ditch supplied water for hydraulic mining operations such as this at the Deep Gravel mine near the mining town of Waldo in southwest Oregon. Many of the mining operations during the Oregon gold rush of 1851 used high pressure water nozzles to excavate gravel from hill sides and wash the rock and sand through sluice boxes to separate the gold. To get this high pressure, the miners needed a water source high above their mine that could be fed into pipes and routed to their mining operations. The Osgood Ditch was used to carry water from the East Fork of the Illinois River to mining operations near the gold rush town of Waldo. The ditch is high on the mountain because its end point, the place where the water was fed into pipes for the mine, had to be high above the mining operations to obtain the necessary water pressure.